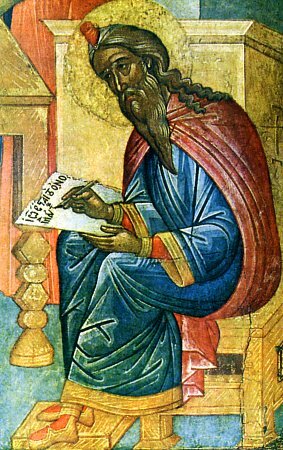 The Holy Prophet Zachariah and Holy Righteous Elizabeth were the parents of the holy Prophet, Forerunner and Baptist of the Lord, John. They were descended from the lineage of Aaron: Saint Zachariah, son of Barach, was a priest in the Jerusalem Temple, and Saint Elizabeth was the sister of Saint Anna, – the mother of the MostHoly Mother of God. The righteous spouses, "comporting themselves through all the commandments of the Lord blameless (Lk. 1: 5-25), suffered barrenness, which in the Old Testament times was considered a punishment from God. One time during the occasion of service in the Temple, Saint Zachariah received the news from an Angel, that his aged wife would bear him a son, who "wilt be great before the Lord" (Lk. 1: 15) and "wilt go before Him in the spirit and power of Elias" (Lk. 1: 17). Zachariah was doubtful of the possibility of the fulfilling of this prediction, and for his weakness of faith he was punished by becoming unable to speak. When Righteous Elizabeth gave birth to a son, through the inspiration of the Holy Spirit she announced that his name was John, although earlier in their family line no one had been given such a name as this. They asked Righteous Zachariah and he likewise wrote down on the writing-board the name John. Immediately the gift of speech returned to him, and inspired of the Holy Spirit, he began to prophesy about his son as being the Forerunner of the Lord. When impious king Herod heard from the Magi about the birth of the Messiah, he decided to kill at Bethlehem and its surroundings all the infants up to 2 years old, hoping that in this number would be also the new-born Messiah. Herod well know about the unusual birth of John and he wanted to kill him, fearing that he was the foretold King of the Jews. But Righteous Elizabeth hid herself away with the infant in the hills. The murderers searched everywhere for John. Righteous Elizabeth, catching sight of her pursuers, began tearfully to implore God concerning their safety, and immediately the hill opening up concealed her together with the infant from their pursuers. In these tragic days Saint Zachariah was taking his turn making services at the Jerusalem Temple. Soldiers sent by Herod tried in vain to learn from him the whereabouts of his son. Then, by command of Herod, they murdered this holy prophet, having stabbed him betwixt the offertory and the altar (Mt. 23: 35). 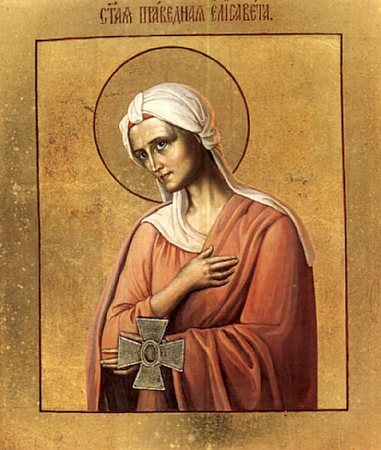 Righteous Elizabeth died 40 days after her spouse, and Saint John, preserved by the Lord, dwelt in the wilderness until the day of his appearance to the nation of Israel.